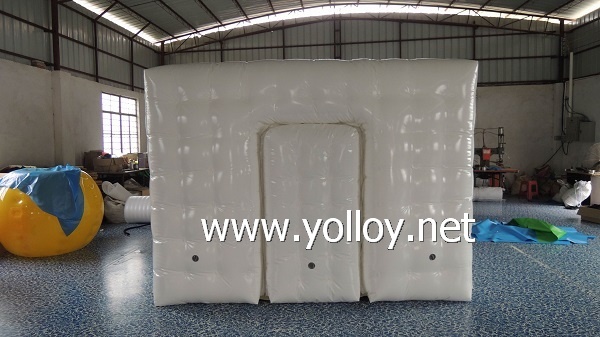 This is a sealed inflatable cube tent and it is widely used as portable studio, traverling shop, It's also a very good option as propaganda both for indoor and outdoor advertising activity.We produce it in 1000D PVC tarpaulin material by high heat welding,it is easy to set up by air pump to make it inflate and after it inflated,it can keep the shape for few days,will not need the electric power to inflate it all the time. All the size color,window and door can be customized as your requirement.If you have any idea, please share with us, we would be glad to work with you. There are fasten D rings on the bottom, so the tent can be anchored for safty consideration. Below photo is the details of the tent. We are the factory specialized on making the inflatable items in China more than ten years.We are good at inflatable tent,bouncer castles and water park toys and custom making is also available.All the size,color,logo can be customized according to your requirement. If any interested in it,please do not hesitate to contact us,we will be glad to offer you.